↑ "Hillary Rodham Clinton". PBS. http://www.pbs.org/wgbh/americanexperience/features/biography/clinton-hillary/। আহৰণ কৰা হৈছে: December 2, 2014. ↑ Troy 2006, p. 71. ↑ Troy 2006, p. xii. ↑ Rajghatta, Chidanand (January–February 2004). "First Lady President?". Verve. Archived from the original on July 1, 2004. https://web.archive.org/web/20040701113441/http://www.verveonline.com/27/people/hillary/full.shtml. ↑ Allen and Parnes 2014, pp. 48–52. ↑ Myers, Steven Lee (July 1, 2012). "Last Tour of the Rock-Star Diplomat". 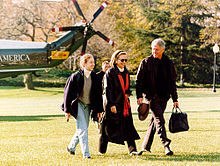 The New York Times Magazine: পৃষ্ঠা 18–23, 49. http://www.nytimes.com/2012/07/01/magazine/hillary-clintons-last-tour-as-a-rock-star-diplomat.html. ↑ Allen and Parnes 2014, pp. 58–60. 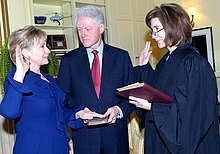 ↑ "Senate panel backs Clinton as secretary of state". Associated Press. NBC News. January 15, 2009. Archived from the original on 2014-04-09. https://web.archive.org/web/20140409043257/http://www.nbcnews.com/id/28624112/. ↑ Falcone, Michael (December 19, 2008). "Bush Approves Bill Reducing Secretary of State's Pay". The New York Times. http://thecaucus.blogs.nytimes.com/2008/12/19/bush-approves-bill-reducing-secretary-of-states-pay/. ↑ Jones, Jeffrey M. (January 13, 2009). "As Senate Hearings Begin, Hillary Clinton's Image Soars". Gallup Organization. http://www.gallup.com/poll/113740/Senate-Hearings-Begin-Hillary-Clintons-Image-Soars.aspx. ↑ Phillips, Kate (January 21, 2009). "Senate Confirms Clinton as Secretary of State". The New York Times. http://thecaucus.blogs.nytimes.com/2009/01/21/senate-debates-clinton-confirmation/. ↑ Rudin, Ken (December 1, 2008). "Obama Brings Hillary to Cabinet, GOP to Ariz. State House". NPR. http://www.npr.org/blogs/politicaljunkie/2008/12/obama_brings_hillary_to_cabine.html. ↑ Chozick, Amy (April 12, 2015). "Hillary Clinton Announces 2016 Presidential Bid". The New York Times. http://www.nytimes.com/2015/04/13/us/politics/hillary-clinton-2016-presidential-campaign.html. ↑ Alan Rappeport, Yamiche Alcindor & Jonathan Martin, Democrats Nominate Hillary Clinton Despite Sharp Divisions,, New York Times (July 26, 2016).